Born in 1946 in Murter Island, Nikola Bašic is an important figure in the contemporary Croatian architecture scene. Self-described as standing “apart from trends and fashion”, Bašic trained in Sarajevo and is now living and working in Zadar, a small town of 75,000 inhabitants and the historical centre of Dalmatia, a historical region of Croatia on the Eastern coast of the Adriatic Sea. The Sea organ and Greeting to the sun built between 2005 and 2008. 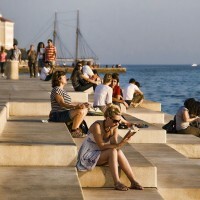 Inspired by Alfred Hitchcock, who once declared that Zadar’s sunset was the most beautiful in the world, Bašic imagined a series of seven flights of 10-metre-wide stone stairs that extend to the sea. 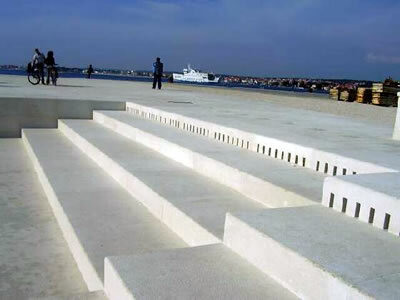 The Sea organ also includes polyethylene pipes that, under the pressure of water, create a natural music that resonates over the public space. In 2008, Bašic added a second installation on the same site. 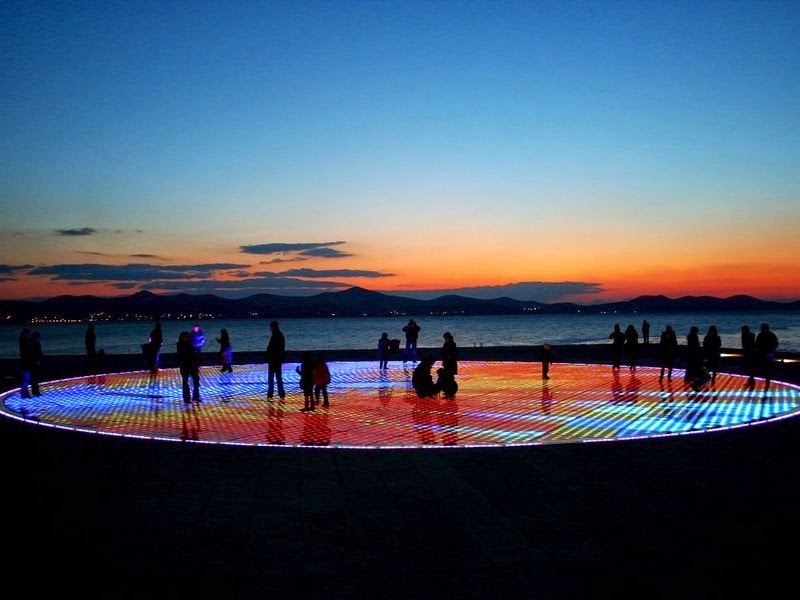 A 22-metre-diameter glass circle diffusing lights of various intensity and colors produced thanks to a photovoltaic system. 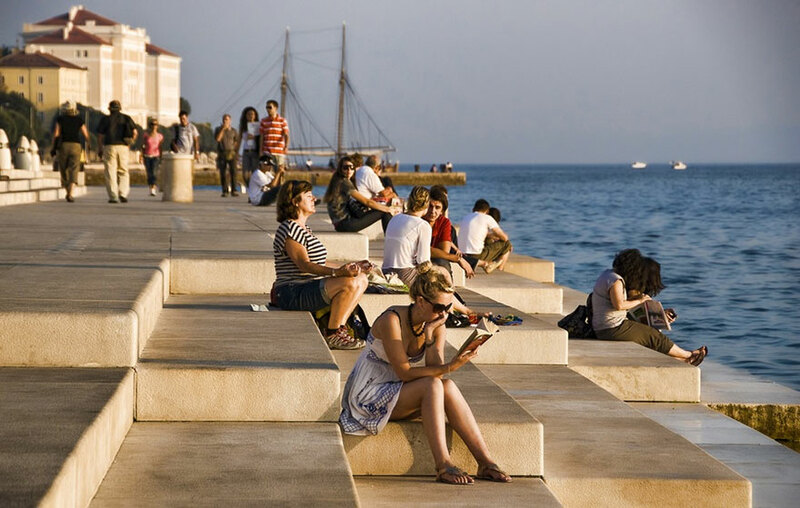 The Sea Organ part (morske orgulje) is is a natural musical instrument, seventy meters long with thirty-five organ pipes built under the concrete. The musical pipes are located so that the sea water and wind movements produce musical sounds that are heard by passers by so that it achieves a communication with nature and promotes a unity of architecture and environment. As sea forces and energies are unpredictable in terms of tides and winds, this organ offers never-ending concert of numerous musical variations in which the performer is nature itself. Each musical organ pipe is blown by a column of air, pushed in turn by a column of wave-moved water, through a plastic tube immersed into the water. The pipes’ musically tuned sounds emanate to the surroundings through apertures in the vertical planes of the uppermost stairs. The 7 successive groups of musical tubes are alternately tuned to two musically cognate chords of the diatonic major scale. Air Holes along the top row of the steps let the Sea Organ Breathe in air to be transformed into musical sounds as the next wave plays its song. The outcome of played tones and/or chords is a function of random time and space distribution of the wave energy to particular organ pipes. In the Dalmatian part of Croatia the prevailing musical tradition is the spontaneous four-voice male singing, with melodies and chords conforming to the diatonic major scale. The 5 musically tuned pipes of each section are arranged in 1.5 meter spacings. A listener, standing or sitting on a chosen point on the scalinade, should be able to hear 5 to 7 musically tuned pipes play their natural music. Thus, whole five-pipe sections are tuned to one musical chord. 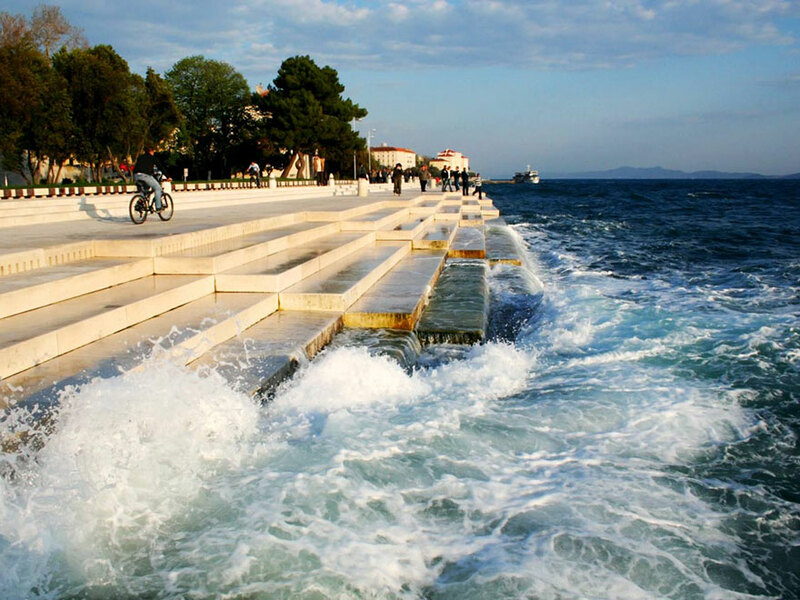 The citizens of Zadar are extremely proud of the first natural musical organ driven by the sea waves ever to be constructed. 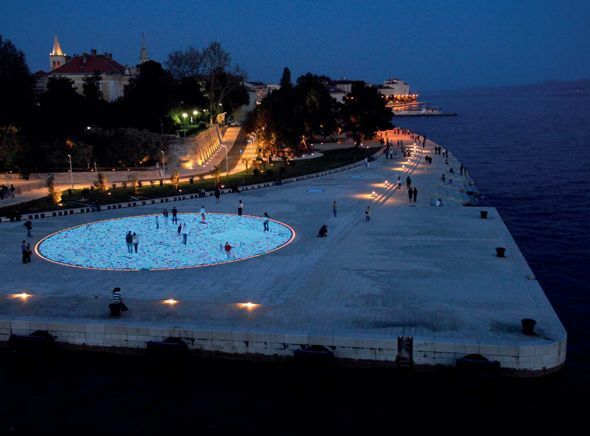 This installation, absolutely unique in the world, was designed to let people enjoy the point where the medieval town of Zadar embraces the Adriatic. Greetings to the Sun is a permanent art installation located on the waterfront. The installation consist of three hundred multi-layered glass plates arranged in a circle, encasing solar cells that absorb sunlight during the day. After sunset, the glass plates produce a brilliant animated light show powered by the energy absorbed during the day. 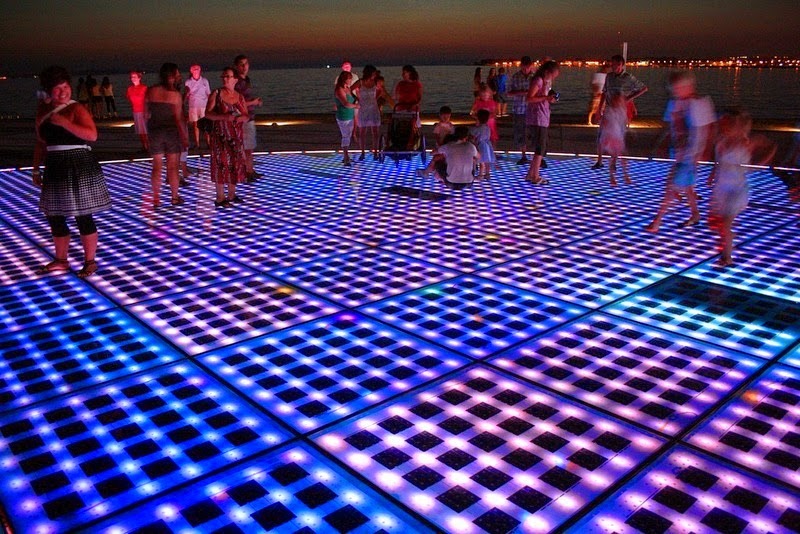 The solar energy absorbed by the solar panels is used to power not only the light display, but also a portion of Zadar’s waterfront for a third of the cost. It is estimated that the display generates about 46,500 kWh of electricity a year.